Sacrifice Beads - Free Easter kids craft. Great children's project for Bible study or Religion class! The sacrifice beads, I've been told, were introduced by Saint Theresa as a way to encourage making sacrifices, especially during the Lenten season. 1 Cross approximately 1 1/4"
1 Religious medal approximately 1"
First you'll need to attach your medal to the center of the string. I find it easiest to fold the string in half and pass the fold through the ring on the medal, then pass the two loose ends of the string through the loop in the string. Now your medal is secured to the center of the string. Take your first pony bead and thread it onto the string by passing one end of the string through the hole in the pony bead and the other end of the string through the hole from the opposite side of the bead. The string that came out the left side of bead #1 should pass back through the hole in bead #2 from left to right and the string which exited bead #1 on the right should be passed through bead #2 from right to left. Repeat step #3 for the 8 remaining beads. 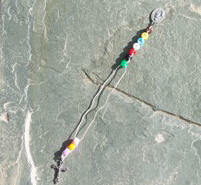 Once all ten beads are on the string, knot the two loose ends of the string together. Finally we'll attach the cross in the same basic way we attached the medal to the other end. To do this, pass the knotted end through the loop ring (hole) in the cross then pass the opposite end of the string (the end with the medal and beads on it) through this loop and pull taught. Your sacrifice beads are now ready to use. To use: Start with all the beads at one end. Each time you make any "sacrifice" slide one bead down to the opposite end. By keeping the beads with you all the time, it will serve as a reminder to make sacrifices to honor Jesus' ultimate sacrifice for us.